Top 10 Best Paid Survey Sites To Make Money Online, Scam-Free! I absolutely love taking online surveys and always have. This is truly a way for me to earn extra money and it's incredibly easy to do. I'll be honest, it is not something I do daily, but I will take the time to complete several surveys in my spare time. Whether you're a teenager, stay at home mom or dad, college student, or anyone looking to supplement your income, these are legitimate survey sites that really pay you for your time and effort. 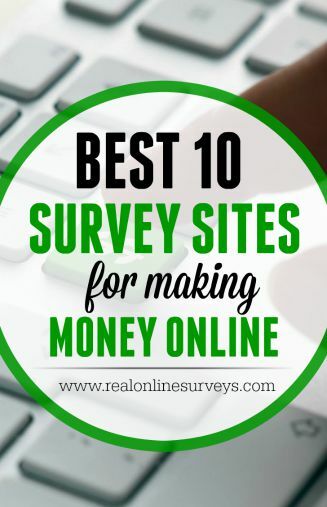 I sincerely hope you can make some meaningful money out of these 10 paid survey sites. Best 10 Paid Survey Sites You Must Join! 1. Pinecone Research – Read Review – Pinecone Research is one of the top paid survey sites where online surveys are emailed to members. Pinecone Research typically rewards its members $3.00 for every survey completed. Payment are made by check. 2. Global Test Market – Read Review – Global Test Market is a paid survey site that help companies develop new products and services. For every survey you complete, members are awarded points. The survey lengths will vary, but are typically between 10 – 20 minutes. You are paid by check, Paypal, Amazon gift cards, Wal-mart gift cards, or even the option to donate to charity. 3. MySurvey – MySurvey is a large paid survey site will allow you to take online surveys in multiple countries. Typically completed surveys are worth between 10-500 points. You must have $10 in points to redeem. 4. Survey Spot – Surveyspot rewards its members with a variety of prizes. It is completely free to join and the company pays up to $5 per online survey. You can request payout when you have earned $5 so it is possible to cashout quickly via Paypal. Other rewards include airline miles, Amazon gift cards, iTunes e-vouchers, and more! 5. Ipsos I-Say – Ipsos is one of the best paid survey sites in the world and operate in many countries. What I like most is that Ipsos I-Say actually pays during the screening process. What this mean is that you make money for any attempt at any survey, even if you don't qualify, points are awarded to you. You are reward with free products, iTunes gift cards, Visa prepaid cards, amazon giftcards, and more. 6. Opinion Outpost – Read review – Opinion Outpost is an free paid survey panel where members share their opinions on a variety of paid survey surveys. The survey topics will vary on current topics and products. You can cashout with a minimum of 50 points. Rewards Offered: $5 Amazon gift cards ( 50 pts), $10 Cash paid via PayPal (100 pts), iTunes gift cards, VISA prepaid giftcards, charity donations, and more! 7. Mintvine – Mintvine is a newer survey panel that rewards you in cash and prizes for participating in online surveys. Typically surveys are worth between 150 to 300 points each, and you will receive 5 points even if you don't qualify to complete a survey. You can cashout through paypal or dwolla once you have accumulated 1000 points (equivalent to $10 Cash). 8. Survey Savvy – Survey Savvy is another one of my favorite online survey panels. They have been around since 1999 but the company that owns them has been around much longer. Pay is only by check with no minimum balance required. 9. Paid Viewpoint – Read review – I joined this site in 2013, and I actually love this site because of the short surveys. What I really enjoy about Paid Viewpoint, is that you get paid for every answer you submit, even during the registration process. They are affiliated with the company Instant Cash Sweepstakes, which is another one of my faves. Pay is Paypal only with a $15 cash out threshold. 10. E-Poll – E-Poll is a paid survey site where members can earn points for taking surveys, creating polls, and referring friends. This site is great for teens 13 and up to earn a little side cash. The great thing I like about E-poll is, you will qualify for every survey you attempt, so no time is wasted. Points are redeemable for cash (Paypal), gift cards and prizes.